(1564-1629) went into exile with his calvinist family in 1580. He studied in Bremen, Marburg, and Heidelberg. During his professional career after the Reductie of 1594 he held many positions, among others as councillor, member of the Raad van State and of the Estates-General, and burgomaster of Groningen. He fulfilled five terms as Curator of the Academy. (Groningen 1419-1489 Groningen) was a pupil of St. Maarten's School. Later he lived in Zwolle, first as a pupil, then as a teacher at the school of the Brothers of the Common Life. In 1449-1474 he travelled through Europe, studying and teaching theology and philosophy in Cologne, Heidelberg, and Paris. After his return to the Low Countries he lived in the monastery Agnietenberg near Zwolle, in the monastery at Aduard and in the town of Groningen. He died in the Rode Weeshuis (Red Orphanage) in Groningen and was buried in the Martinikerk. 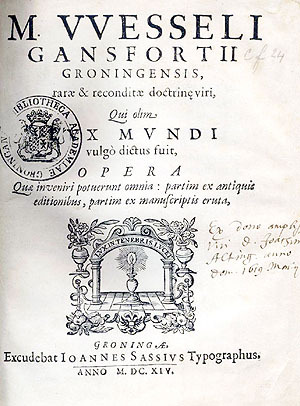 Gansfort's Opera omnia were published in Groningen in 1614 to celebrate the foundation of the Academy. Title page of Opera Omnia by Wessel Gansfort, printed to celebrate the foundation of the Academy in 1614, by the first a Academy printer Hans Sas. Donations were very important for the growth of early modern libraries, without a fixed budget, including the one in Groningen. To thank these benefactors and to incite others to follow their example, the names of donors were entered in the catalogues. An appropriate note was made in the books as well. Significantly, one of the library rules of 1668 states that the professors, the librarian in particular, should do their utmost to incite distinguished persons to provide generous endowments. Moreover, the academy printer - a function that had been created at the time of the founding of the library in 1615 - had to present to the library a copy of every book he printed. 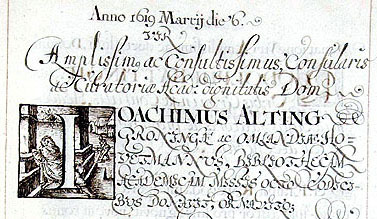 Thus Hans Sas, the first academy printer, donated a copy of Ubbo Emmius' Chronologicum Novum in 1621. Newly appointed professors had to present at least one book to the library, and copies of their own publications were expected as well. They also had to bequeath one or more books. If their personal library were to be auctioned, the Academy Library should receive a share of the proceeds. Donors were often eminent citizens with connections to the new university. Undoubtedly, there have been deliberations on the choice of books with the professors and the librarian. 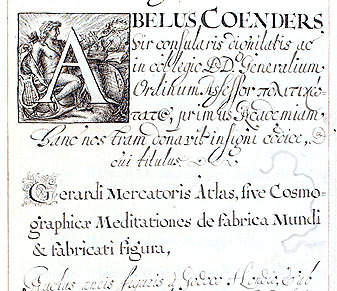 The first present is dated 18 August 1615, when Abel Coenders donated a Mercator Atlas (Amsterdam 1606). Unfortunately, this book is no longer in the library On 6 March 1619 Joachim Alting presented eight volumes, including the collected work of Wessel Gansfort published on the occasion of the foundation of the Academy in 1614. 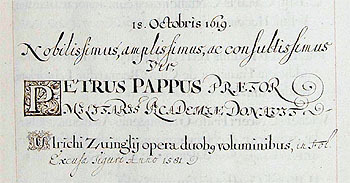 Also in 1619, Gansfort's editor, Petrus Pappus von Tratzberg, presented two volumes of Zwingli's works. In 1620, Rudolfus Wicheringe, who had been a student of the famous Danish astronomer Tycho Brahe, donated twenty books, among them a manuscript on the Institutiones by Mello Brunsema, who had taught law in Groningen from 1596 until 1601. In that same year, Arnoldus Justus count of Bentheim presented seven books, including a five-volume manuscript of Raynerus Pisanus' Pantheologia. Nine volumes were donated by Edzardus Jacobus Clant, one of the Curators of the Academy, on 22 January 1622. From the library of his wife, Susanna van Ewsum, who died a month later, a bible in German was given to the library. This is the only known donation from the bequest of a woman.